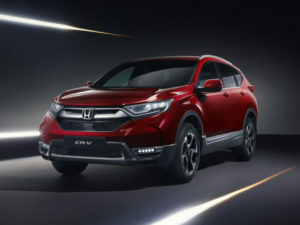 Making its debut at Geneva, the European production version of the CR-V follows the launch of the US model and marks the first use of Honda’s hybrid technology in an SUV for Europe. Comprising a 2.0 litre i-VTEC Atkinson cycle petrol engine and two electric motors, the Intelligent Multi Mode Drive (i-MMD) hybrid system is said to deliver real-world efficiency, although fuel and CO2 figures have not been announced. It also uses a single fixed-gear ratio instead of a conventional transmission, said to bring a smoother transfer of torque. The only other engine on offer will be a 1.5-litre VTEC turbo petrol married up to a six-speed manual gearbox or an optional CVT automatic transmission and claimed to bring class-leading fuel economy. Both powertrains are front-wheel drive as standard but both be specified with Honda’s all-wheel drive technology with Intelligent Control System. Ground clearance has been increased by 38mm for all variants, up to a height of 208mm for the AWD petrol model. Slightly larger than its predecessor – with a longer wheelbase and wider stance – the new CR-V also offers the option of seven seats for the first time. These are said to bring exceptional leg room as well as a 101-degree seat angle to aid comfort and class-leading access. The CR-V also brings increased boot capacity with a new two-position boot floor and a Hands-Free Action power tailgate and single-action 60:40 split-fold second-row seat backs for easier loading. First deliveries of Honda CR-V petrol models are expected in autumn 2018 with hybrid models following early in 2019.